There’s a long history of memorial gestures in NASCAR. Here are some examples. Alan Kulwicki was the 1992 Cup Champ as the 1993 season started. The season was headed to its sixth race of the year at Bristol Motor Speedway, arguably Kulwicki’s favorite track, when his jet crashed prior to landing on April 1st. His hauler, which had already arrived at the track, made one last silent lap around the track before. Since he owned his own team, it was more or less left in shambles, but from that race on the majority of cars ran his style #7 on their cars. Now that same year, the sport lost Davey Allison. Allison was the one of the ones who had lost the championship to Alan the year before. In July, en route to a test session at Talladega Superspeedway, his helicopter crashed in the infield. Allison was quite literally the Jeff Gordon of his day, so in a period of under six months, the sport lost its most recent champion and its brightest star. From then on, in addition to the #7 on the cars, teams began running Allison’s stylized #28 as well. Not every team was running them by the end of the year, but after each race they would pay their respects much like this. There weren’t many deaths from then until the 2000 season. That May, fourth-generation driver Adam Petty was killed in an accident during practice for a race in NASCAR’s AAA league. Cars wore this decal for the rest of the year. His father, Kyle, and grandpa, Richard, had based the future of their team around Adam. Kyle took over driving duties for Adam’s #45 (he could not bear the thought of another driver driving Adam’s car), and when the series came back to the track where Adam was killed, Kyle would run a black car instead of his usual scheme. He did this until his last start there in 2007. That July, at the same track, Kenny Irwin Jr. was killed. Teams carried this decal for the rest of the season. The team he drove for, Sabco, went so far as to change the paint scheme and car number after that week. They did not run that car number again for three years. 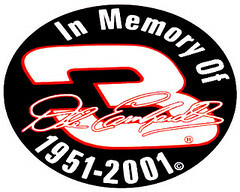 In February of 2001, as most everyone knows, Dale Earnhardt was killed at Daytona. 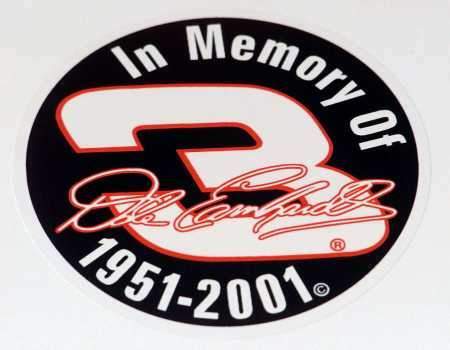 The decal that was run on many cars was, at least from my memory, was this one. Again, the team changed the paint scheme and number at the next race, and his #3 has not run in Cup competition since that day. Now if you want to see a memorial, this is the mother of memorials: First off, for every race until the 2002 Daytona 500, the third lap of every race was silent. There would be no announcing, just the cars going around the track. Everyone in the stands, and I mean everyone, would stand up with three fingers in the air. They did that for the next 36 races. Each track had a memorial in their own way. For instance, Las Vegas Motor Speedway had this on the exit of Turn 3. People can mock this all they want, but only fans of the sport can really understand what that year was like. One of those things that still get people teary-eyed today. The car Earnhardt used to drive was taken over by Kevin Harvick and changed to #29 the following race. Both driver and car number are still racing today. The owner of the team, Richard Childress, considered Earnhardt to be his best friend. He had made the team, RCR, the successful powerhouse team it is today. As such, the 29 car now runs with the number 3 on the sides. Every year Childress renews the rights of the #3, and every year he chooses not to run it. Those are the major ones of the last 20 years or so. What makes the Jimmie Johnson decal different as that it is extremely personal, much like Childress choosing to run the #3 on the 29 car. As far as I know, that is not very common.